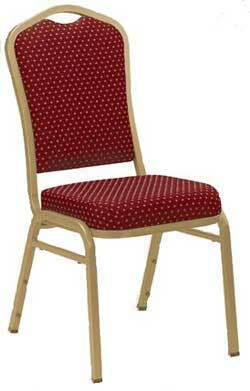 Add an elegant touch to your lecture hall, banquet area or any room with the National Public Seating 9300 Stack Chair. The sleek chair back features front and back fabric panels that create a thicker and more formal-looking chair. Sit comfortably on the 2" padded seat. The sturdy steel frame is available in three colors and holds up nicely to daily wear and tear. Bumpers protect your chairs from scratches while stacked. Choose from a selection of jewel-toned vinyl and fabric colors.